Over a period of time air will collect within your central heating circuit. This forms cold spots and the panels become less efficient at pumping out the heat. That being the case bleeding radiators around your home is one of the simplest things you can do to improve the operating efficiency, making your home more comfortable. This simple process is best explained in the video below hosted by Craig Phillips. Remember him? The all round good egg from Big Brother 1? Anyway it’s under 3mins so give it a watch, there are also some simple instructions beneath. First off switch the heating on and get the radiators around your home nice and warm. This will also build up the pressure in the radiators. Next go around each radiator and make a note of the ones with cold spots, usually found near the top of the panel. This is where the air has collected. 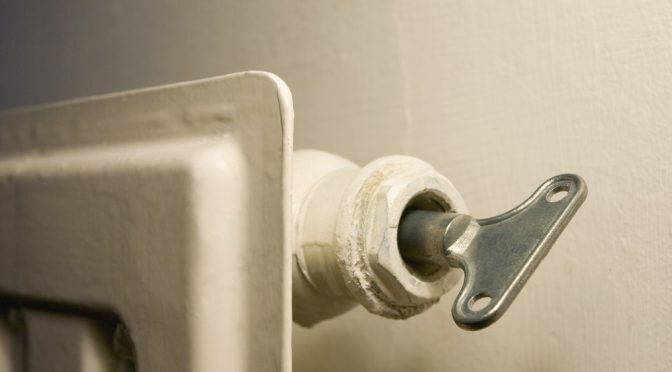 Switch off the heating and once the radiators have cooled a little you can start the bleeding process. If you don’t have a bleed key some valves have a slot in them that will accept a flat head screwdriver. Use the radiator bleed key, a brass one is best, to vent off the excess air. Slowly turn the square bleed screw or screwdriver anti-clockwise. You’ll here the air escaping, hissing as it does. You should use the rags or sponge to collect any drips of water. Once all the air has escaped you’ll get a jet of water rather than a dribble. Close the valve quickly and tighten. Bleed radiators one by one until complete. Turn the central heating back on and check for cold spots once again. Repeat the process as necessary. If despite undertaking this process no air escapes the pressure on the boiler may be too low to force the air out. Follow the procedure, usually found on the front panel of the boiler to top up the pressure. Also if the process is successful the boiler pressure may have reduced and may require topping up.